Last week, in Lesson 3, we managed to get through all the creative example slides in a marathon overly long meeting. 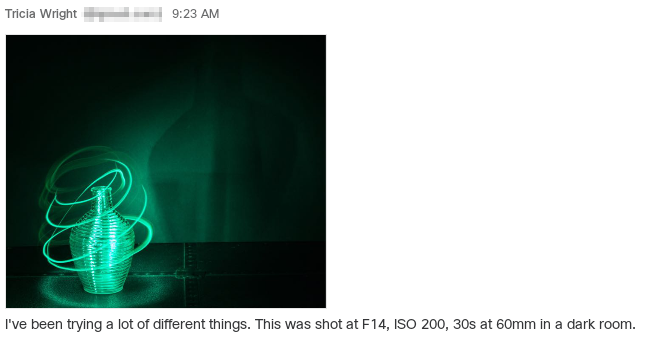 We also talked about what makes a better camera and lens for night photography – and why “full frame” cameras are better at squelching noise than crop cameras – megapixels being equal. The bottom line is that larger sensors usually have larger sensor area to collect light. The larger area collecting light makes larger sensors produce less noise in comparison to the total light collected. A related, whimsical illustration can be found here. Yes, rather technical, but some of our students want to know! Inclement weather means we are stuck to an indoor session, but our photos need processing! We are took a second look at focusing tricks since it is a recurring issue. Indeed, we have covered focus in not one, but two prior articles which we reference here. One method for focus is the Bahtinov mask. The Bahtinov mask is aimed at astrophotographers, but it works well with a regular camera, too. Our more normal list of focus tricks can be found in this article. Like many other night photography subjects, we have done extensive writing about creating star trails. It is no wonder then that we are called “StarCircleAcademy”. Rather than try to summarize many years worth of writing it seems wisest to point you to the articles where different star trail discussions have been chronicled. 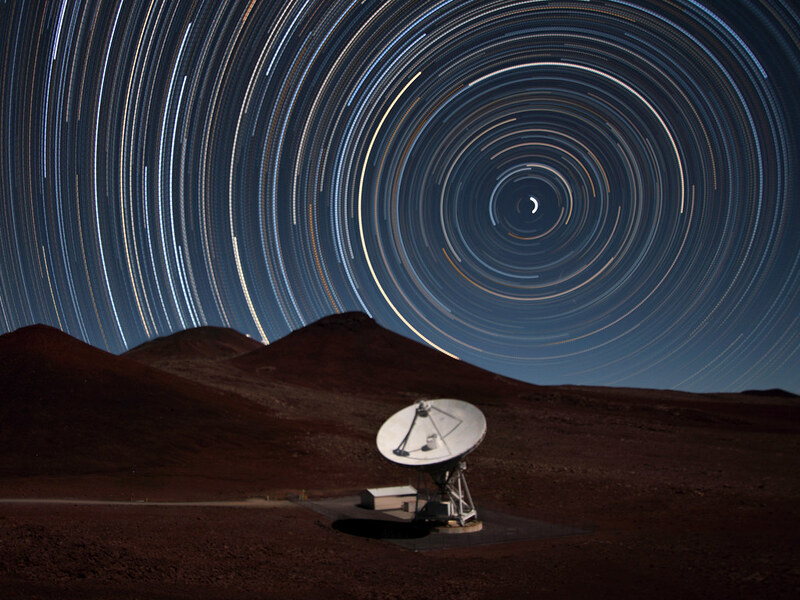 How to combine multiple shots into a star trail is here in this step by step guide. How do you get a better star trail? Try this. Want to do fancy stuff? Try these tricks, or our AdvancedStackerPlus (Photoshop plugin). The moon is full, if you didn’t work out settings for capturing the moon. Something on the order of 1/1000, f/5.6, ISO 4000; or 1/500, f/4.5, ISO 800; or f/9, 1/200s, ISO 400 (latter is best overall as lower ISO means less noise). 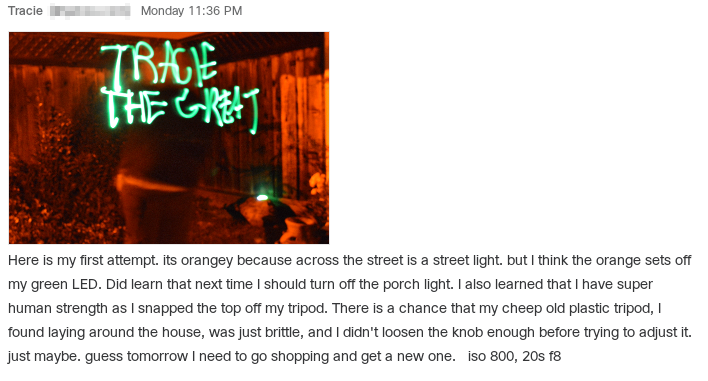 Find a way to make a strong white flashlight a different color… several methods were demonstrated in class. Simple examples: colored cellophane (bread wrapper, etc), bounce light off of or shine through colored paper, or even use your hand as a reflector / light bouncer. Blue “white” LED flashlight can be made warmer using your hand or something in the yellowish range – see above. Gaffers Tape can be used for all sorts of things, stopping light leaks through the viewfinder (Nikons are notorious for this), making a “snoot” for a light, covering over offendingly bright lights… and even holding stuff together. Weather Permitting, get at least 20 minutes worth of star trails. First determine what the best starting exposure is, then take 20 minutes worth. More is better, though for the reasons we demonstrated in class. 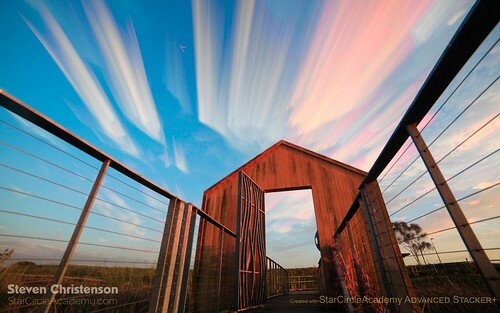 Get StarStax or AdvancedStackerPlus for Photoshop and combine those trails. Or do it by hand in Photoshop. This is not a star trail, but it was a sequence of shots combined using the same trick. 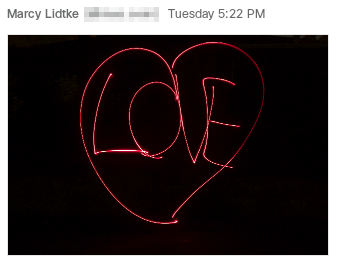 You could even, for example, do a series of light painting. This entry was posted in Uncategorized on April 27, 2016 by Steven Christenson.